Verdi, Attila. Metropolitan Opera, 2/23/2010. Conducted by Riccardo Muti and no one really cares about anything else. 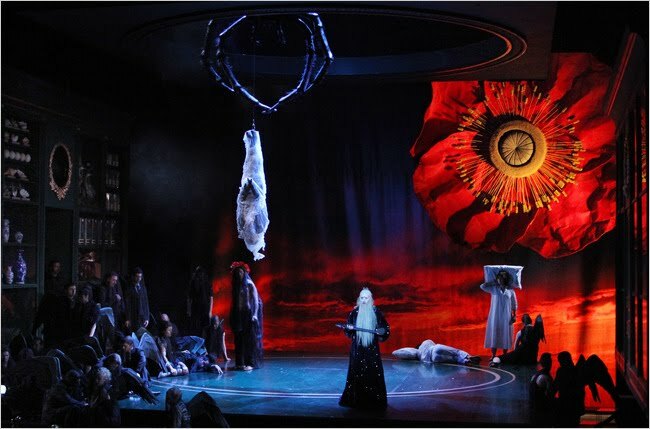 No, wait, it was a new production by Pierre Audi with Violeta Urmana (Odabella), Ramon Vargas (Foresto), Giovanni Meoni (Ezio) and Ildar Abdrazakov (Attila) with sets and costumes by Herzog, de Meuron, and fat-phobic Miuccia Prada. The story of this show, for good and ill, begins and ends with Riccardo Muti. The good is that the music had tremendous style and shape, the orchestra sounded fantastic, and the singing was variable but committed. The bad is that Muti wields his power over directors in ways not necessarily conducive to dramatically exciting productions. The most important thing seems to be that the singers have an uninterrupted view of Signor Muti at all times. I got the feeling that the director and designers were very aware of this and were trying to make the restrictions part of their concept, but it backfired a bit. They might have been aiming for the formalism of Greek tragedy, but the blocking was so sparse it just ended up static and stiff. Not a successful collaboration, but the production has redeeming qualities, and I enjoyed it. Purely as looks, I liked a lot of the design. It’s certainly more visually striking and original than many other endeavors this season (e.g. Carmen, Hoffmann, Tosca). The prologue begins on an enormous pile of rubble, most of the other scenes are staged against an enormous curtain of greenery. * But both provide little space for movement. The costumes are vaguely steampunk post-apocalyptic something, including a scary Marge Simpson/Bride of Frankenstein ‘do for Odabella, but even from my seat around a third of the way back in orchestra (thanks, lady who rescued me from standing room!) only some of the details read–namely the car-wash fringe on Ezio shoulders and the occasional LED lights. Most of it was too dark. Also, all the hems were too long, everyone was holding up their skirts and capes all evening. 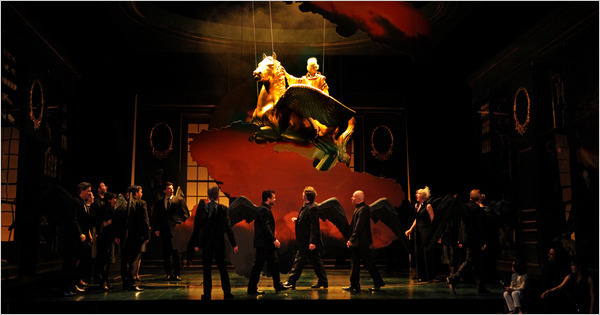 The blocking was, to put it gently, minimal, clustered in the stage’s limited spaces, all of which coincidentally were near Muti. There were some efforts to be static with ATTITUDE, most successfully by Urmana, but generally everyone just stared out at the audience at Muti. A sympathetic interpreter would say that the concept is that the characters are caught in a destroyed (rubble) and wild (forest) world where human connections are impossible, Attila’s army is nothing more than a faceless mass (in fancy t-shirts). A less sympathetic one would say that this distant approach is a poor fit for a work that has a lot of passionate relationships, both of love and hate. I’m somewhere in between these two. OK, now for the music. The orchestra sounded fantabulous from the first bars. The strings had an amazing gauzy quality, I was never once conscious of there being oom-pahs, though I know there were, I have never heard a less bombastic and bangy account of early Verdi. Or most middle Verdi. It was loud, there was a lot of dramatic contrast, but nothing was underlined solely for flashy effect, it felt right. The singers similarly showed subtlety and sensitivity–in early Verdi terms that is–though their instruments weren’t ideal. I liked Violeta Urmana’s Odabella quite a lot despite some obvious problems. She owned the role and production more than anyone else in the cast, and tore into the music and its considerable quantity of notes. But her high notes were shrill, her middle voice better but not always opulent, and her chest notes loud enough but not exciting. Ildar Abdrazakov should have been the star of the show. The problem is that he wasn’t. He wasn’t bad, his sound is warm and biggish, he looked scary, but he lacks charisma and star power. It seemed like Attila’s part is somewhat dull, which I’m sure in the hands of a star bass it isn’t. The production didn’t help by depriving him of the opportunity to show his power over the troops–the chorus being caught in the set’s underworld. Unmemorable. Ramón Vargas is a tenor of great musicality and cruised through lots of the music with a nice legato. But he lacks the heroic heft needed for this part, he was audible but the voice is just too lyric for an opera this fierce. I think there is strain, his tone is developing an unfortunate flutter similar to Alagna’s in recent years. Finally, Giovanni Meoni subbed for Carlos Alvarez as Ezio and did a fine job with a large, round, pleasant sound, though he lacked something in dramatic attitude I can hardly fault a cover for that (and everyone except Urmana needed an attitude injection, really). As for the booing, I talked to a bunch of people in intermission and afterwards, and their major complaints all seemed to be about the abstract sets. OPEN YOUR MINDS, people. As long as we’re all whining that the Big Wall o’ Green Stuff is not a legitimate visualization of a wild forest, we’re never going to get to get to Level 2 of Abstract Regie, at which point we consider that the forest could perhaps not even have trees and still be OK (GASP). It’s not that there weren’t problems here, but don’t be ridiculous. To catch up with the news, Prada’s skinny replacements for the fired supersized supers were superfluous, though skinny. Also, Robby Duiveman is credited as “Associate Costume Designer” and gets a picture and bio in the program, which makes me wonder as to the extent of Prada’s involvement with the production. There are some memorable scenic effects, most of all some rotating gobos that made the wall o’ green stuff come alive, which made me remember that I missed Lost last night. Do we know if Sayid is a zombie yet? No, don’t tell me. Also, can Daniel Faraday show up wearing Attila’s kickass spiky helmet? Because that would be awesome. Next: Have you seen my Nose? *The wall serves to remind us to visit the David Rubenstein Atrium down the block, which has a very similar albeit smaller green wall designed by the same dudes–also, have a sandwich there, they’re delicious if a bit pricey. Unless you’re in danger of being fired by Miuccia Prada, that is.